I was going to post and share my recipe today for zucchini relish, but then these donuts came along! I discovered yet another use for the overabundant amount of zucchini that keep producing in our garden! I promise…the relish recipe is coming soon! 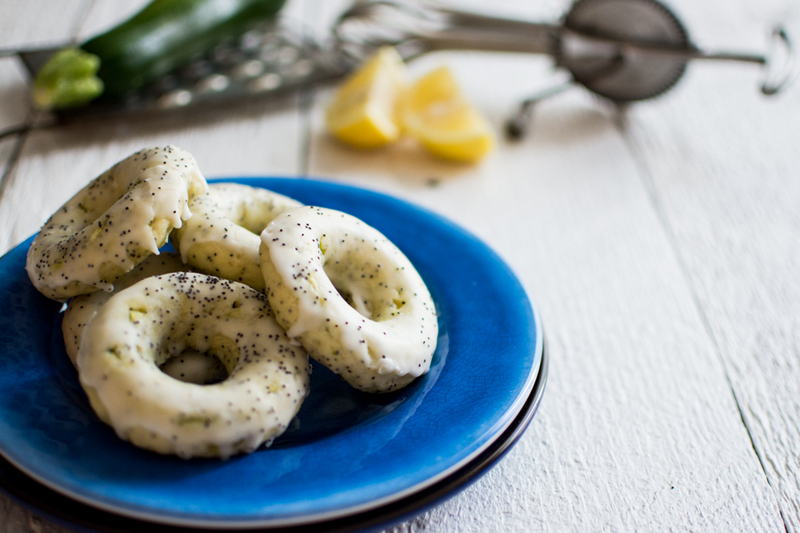 A lemon poppy seed baked donut with zucchini…it sounds so good! Glazed with a lemon/sugar glaze, they taste like the tops of a muffin. It’s definitely summer in a donut! We have been so busy this past week canning, and cooking with all this squash, that I needed a break from the usual zucchini boats, zucchini pasta, zucchini bread, and all other cooked things with zucchini…but then these donuts happened! The flavour is also similar to my zucchini cookies I made last year, a childhood favorite my mother used to make. Baked donuts, I know…you either love em or hate em…some will argue that a donut is not a donut unless fried, but I disagree. These are just awesome! Zesty with lemon, and the buttermilk gives that moist tangy flavor, while the zucchini adds color and texture…what’s not to love! Oh and I should tell you, these bake up in less than 10 minutes! Yes, seriously- by the time your coffee is done brewing, you can have warm summery donuts to nosh on! I hope you are convinced to bake up a batch of these, even if you do not have loads of zucchini growing… borrow some from a neighbor or head over to your local farmer’s market and pick up a few zucchinis….you will be hooked after you taste these refreshing donuts! Preheat oven to 375 degrees. Grease 2 donut pans generously. In a large bowl, whisk together, flour, baking powder, salt and poppyseeds. In a separate bowl, mix together the melted butter, canola oil, sugar, lemon zest, egg and buttermilk. Add the wet to the dry ingredients, folding until mixed. Fold in the zucchini. Batter should be a nit thick. Pour batter into a large piping bag, or use a ziplock bag, and cut the tip off. Pipe batter into pans. It's much easier to pipe this in the pan, than trying to spoon and smooth into the pan. This extra step is only a few seconds and so worth it! Bake donuts for 8 minutes until set. Make glaze by whisking to desired consistency. You may need to add a bit more juice if not thin enough. 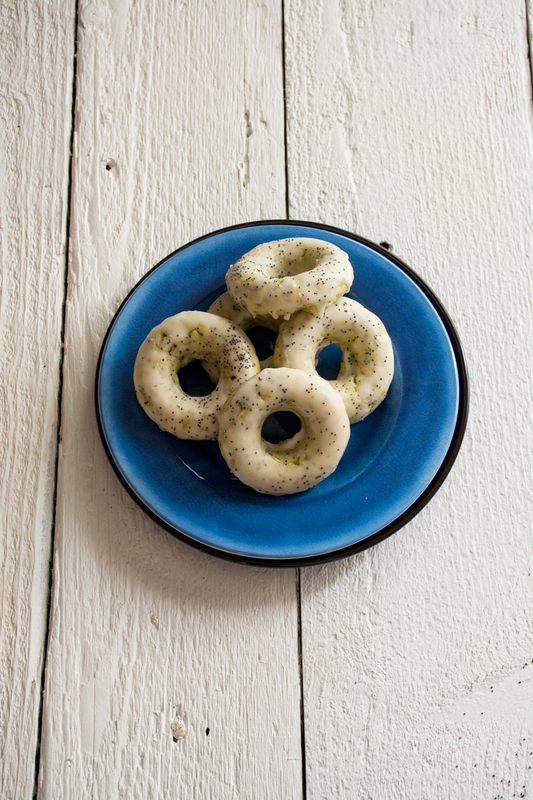 When donuts are cool enough to handle, dip into glaze and sprinkle with poppyseeds. Let dry on a wire rack. OMG these look good. 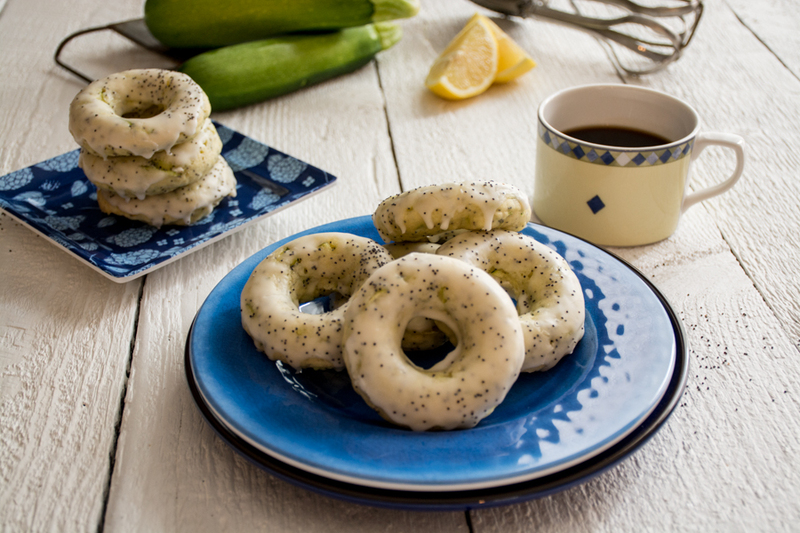 I love anything that involves lemon and poppy seed… and donuts. lol. Pretty photos too. I need to come live at your house. I’d never have a bad meal or treat again! These look AMAZING! Oh my, these look amazing! I will have to try this! Pinned this recipe for later! You’re killing me. These are ridiculously adorable AND look amazingly delicious! YUM! Frying donuts totally turns me off, but baked donuts sound right up my alley! I’ll have to borrow someone’s donut pan to make these. Yum. Tiffany, these donuts remind me of a lost recipe favorite cookie I used to make. Perhaps your Mom has the same one. I will have to try these donuts for sure. On another plate, have you ever used thin strips of zucchini as noodles with satay sauce or other Asian inspired recipes? It is a great way to cut the carbs and really delicious and fast. Do not boil, but stir fry strips in a lightly oiled pan. Flavor with whatever inspires you. I can’ see what you come up with. Thanks Alice, I will for sure experiment with “zucchini noodles”!